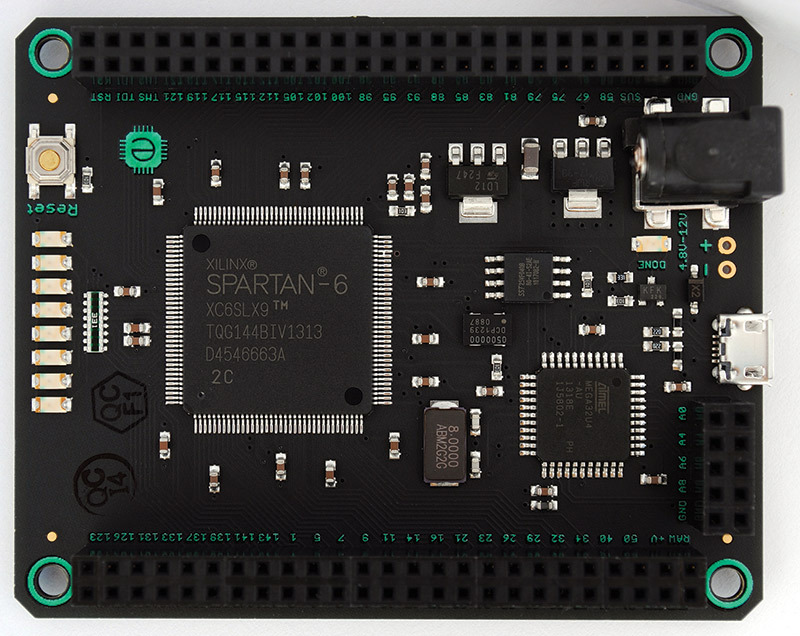 The Mojo V3 board is built around the Xilinx XC6SLX9 which is part of the low cost Spartan-6 family. Sporting over 9,000 logic cells, 16 DSP slices, and 102 I/O pins (84 available for use on the Mojo V3), there is plenty of room to learn! An integral part of the board design is an Atmel AVR ATmega32U4 used to configure the FPGA, USB communications, and to assist with analog-to-digital conversion (ADC). Additionally, there are eight LEDs and a pushbutton on the board available to the user. There is a significant software stack in order to begin using the Mojo V3. However, all of it is free of charge. The first order of business is to download ISE Design Suite 14.7 from Xilinx (if you cannot download the full DVD ISO, Xilinx will mail you a DVD free of charge). Unfortunately, the software is only for Windows and Linux, as the world of FPGAs is not yet Mac friendly. As a Mac user myself, I got around this by running Linux Mint 17.1 in Parallels Desktop 10 and it works flawlessly. If you don’t want to shell out the money for Parallels Desktop, you should have no problem running Linux Mint in VirtualBox. (I have been using VirtualBox for a Windows XP virtual machine for years.) Installation is fairly easy, but be aware that it does take a significant amount of space (20+ GB). For a detailed installation tutorial, please see Embedded Micro’s Installing ISE Tutorial. Okay, with our software stack installed, let’s design something! I think an easy starting point is a 2-to-4 line single bit decoder with Enable. 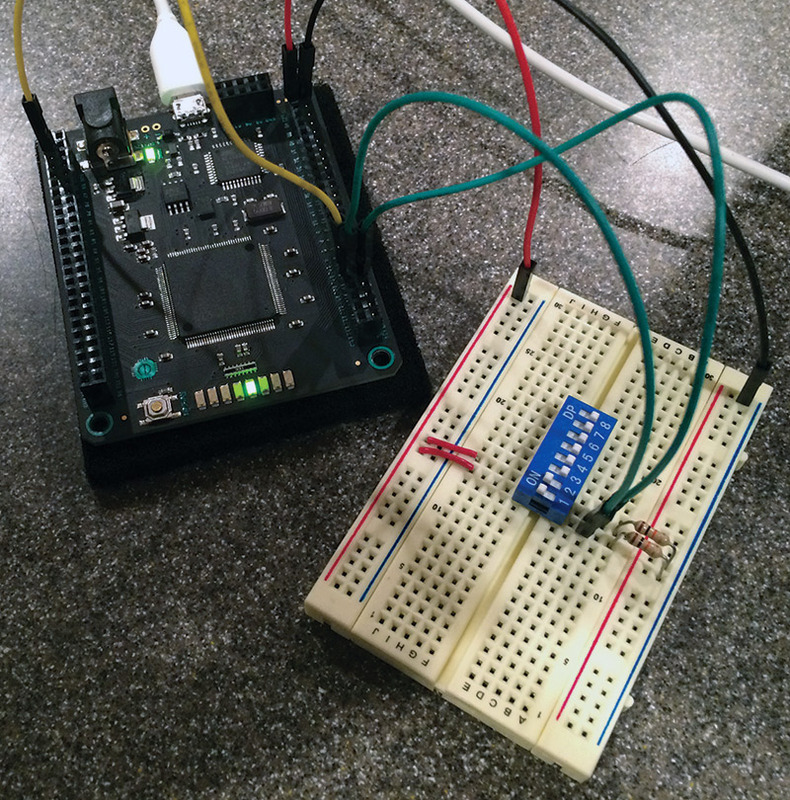 This project will allow us to investigate some basic combinational logic using the Mojo V3. However, before we can start writing hardware (sounds weird, doesn’t it? 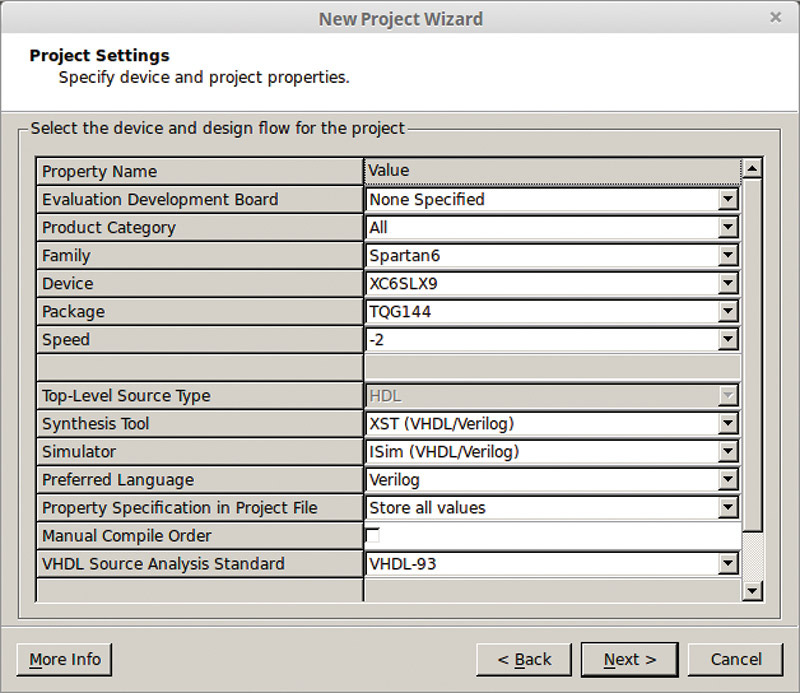 ), let’s cover the basic steps to create a project in ISE Design Suite. With the software open, create a new project (File->New Project...). 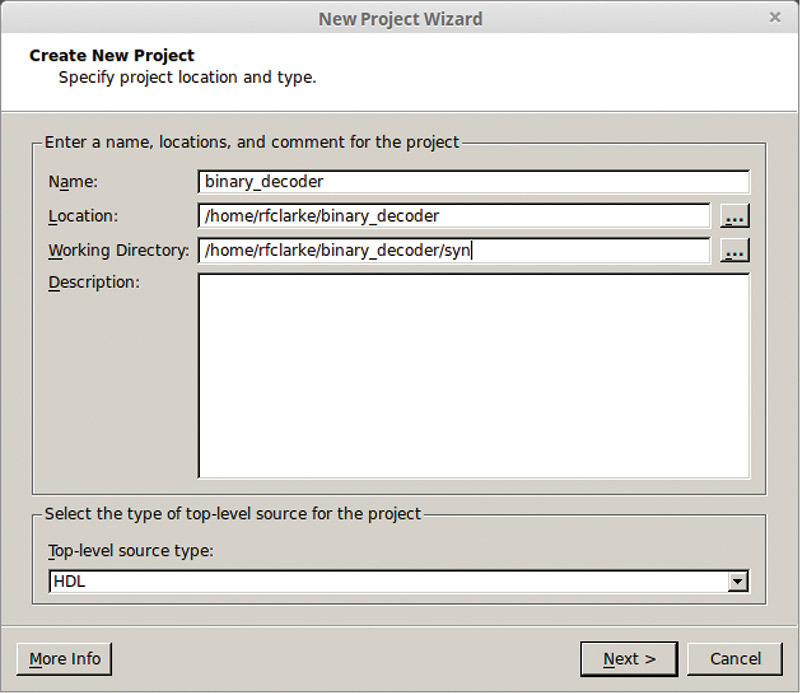 Name the project binary_decoder and add /syn to the end of the Working Directory (trust me on this... ISE loves to make files and this will contain the mess). Click Next (Screenshot 1). SCREENSHOT 1. Create New Project. We need to specify some project settings. The Family should be set to “Spartan6” and the Device to “XC6SLX9.” The Package is “TQG144” and the Speed is “-2.” Now, you’re probably asking me, “How do you know the speed is -2?” Great question! If you look at the FPGA package on the Mojo V3 board, the last line of text says “2C” (Photo 1). Reading the Spartan-6 Family Overview Datasheet, this indicates a speed grade of “-2” and a commercial temperature tolerance. Lastly, verify that “Verilog” is selected as the Preferred Language. Click Next (Screenshot 2). Click Finish on the next window, titled Project Summary. As stated, we’ll be designing a 2-to-4 line single bit decoder with Enable. 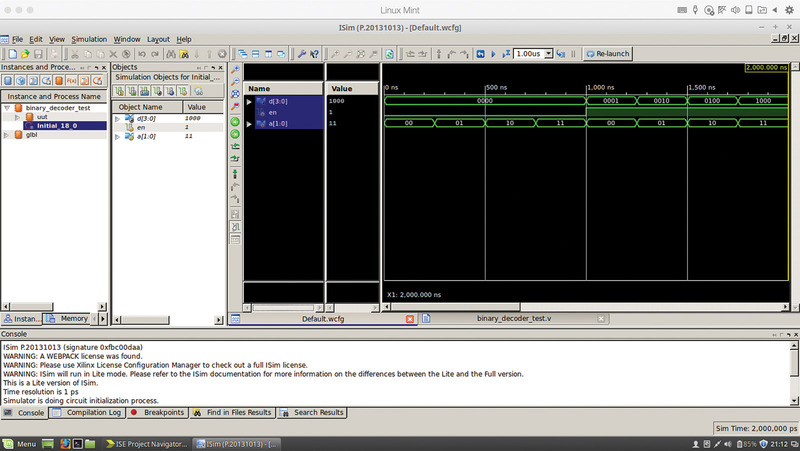 Let’s create the Verilog source for the decoder. 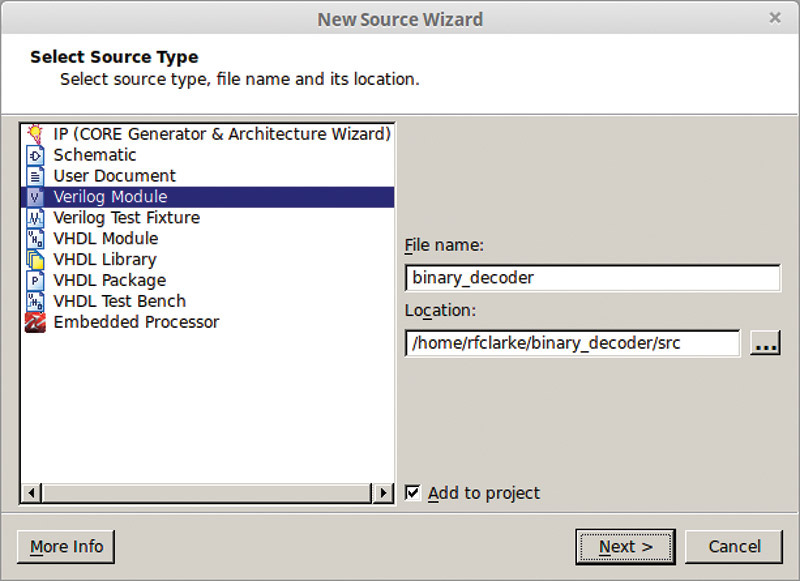 Create a new source (Project->New Source), select Verilog Module, and name the file binary_decoder. Add /src to the end of the Location and click Next (Screenshot 3). SCREENSHOT 3. New source file. At the next window — titled Define Module — just go ahead and click Next; we’ll define our I/O ports later. In the Summary window, click Finish. When it asks to create the src directory, click Yes. Okay, okay. I know you’re chomping at the bit to start coding, but there is only one more step I promise! Select binary_decoder in the Implementation Hierarchy, look below at the Processes tree, and right-click on Generate Programming File. Select Process Properties, check Create Binary Configuration File, and click OK. Done! Let’s write some hardware! Okay, don’t get mad, but ... I may have lied to you back there. Before we can start coding, we need to first look at the truth table for a 2-to-4 line single bit decoder (Figure 1). FIGURE 1. 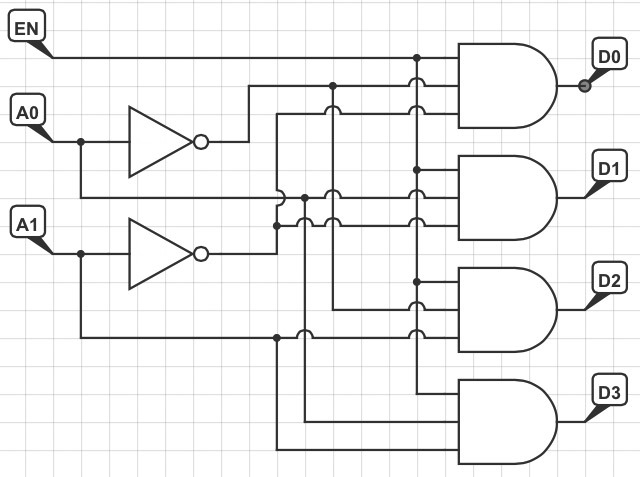 A 2-to-4 line binary decoder with Enable truth table. It’s pretty simple, really. The two-bit binary input, A, corresponds to a specific bit in D, which is four bits wide. For example, an input of A = 10 and EN = 1 creates an output of D = 0100. In other words, A = 2 corresponds to D2 = 1. The logic gate diagram for the truth table is shown in Figure 2. FIGURE 2. The 2-to-4 line binary decoder with Enable circuit diagram. While this is not a tutorial on Verilog itself, let’s break down our code real quick. The first portion of the module defines the inputs and output. We have a single bit input labeled en and a two-bit input labeled a. The four-bit output is labeled d. The last portion simply defines the output as the set of four three-input AND gates, with the appropriate inputs inverted per the truth table. Easy! This file defines which pins are associated with the I/O ports in our modules. The first line is related to how the Mojo V3 is designed. The VCCAUX pins of each of the I/O banks are tied to 3.3V. Long story short, this means we are restricted to 3.3V logic. The other lines should be fairly self-explanatory. I’m sure your next question is, “How do we see the results?” Another great question! With Simulation view selected in ISE Design Suite, select binary_decoder_test in the Behavioral Hierarchy and double-click on Simulate Behavioral Model in the Processes tree below. The ISim software should open automatically. Select the Simulation->Run All menu option and then reselect the Default.wcfg window. Select the View->Zoom->To Full View menu item and you should now be able to view the results of the Test Bench (Screenshot 4). As you can see, our implementation of the 2-to-4 line decoder with Enable works as advertised. 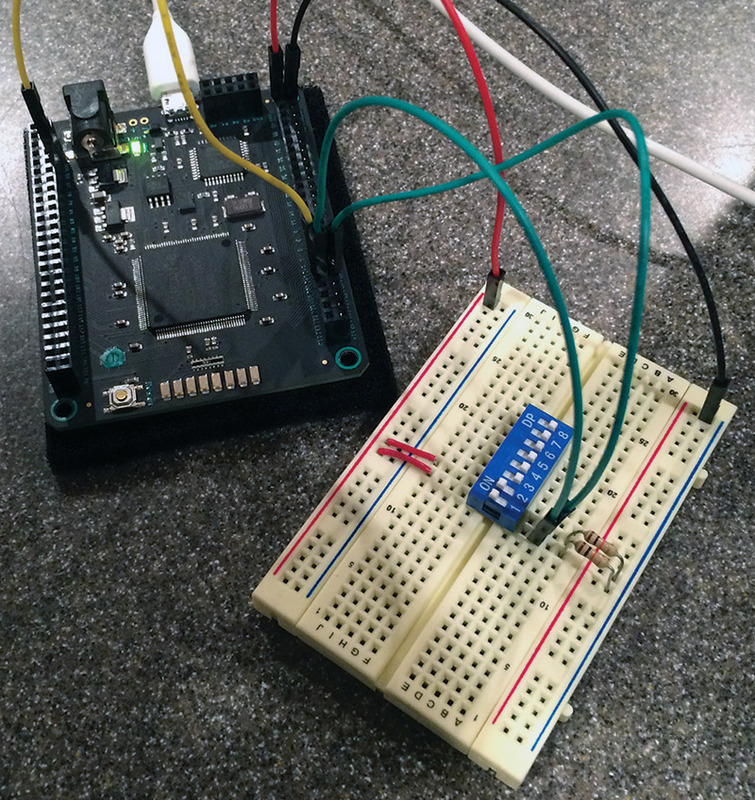 To test the circuit, I wired up an eight-pin DIP switch with 10K pull-down resistors to easily toggle the inputs. Position “1” corresponds to A0 and position “2” corresponds to A1. As you can see in Photo 2, with an input of A = 11, the output is D = 1000 as expected! Photo 3 is the same value of A with EN tied to ground, therefore disabling the output. PHOTO 3. Circuit test: EN = 0; A = 11; and D = 0000. To learn more, I recommend the book FPGA Prototyping By Verilog Examples by Dr. Pong P. Chu. This is the book I am currently working through myself, and it is very easy to follow. In fact, the example circuit we wrote in this article is one of the first suggested exercise experiments by the author.